How can I properly use this dinnerware piece in the oven? This item can be placed in the oven for warming purposes only. To reduce the risk of breakage, refrain from transporting the piece from one extreme temperature to another. It is recommended that you slowly heat up the item in the oven rather than placing it directly in an oven that has already been set to a high temperature. Serve soups, salads, sides, and more in this elegant CAC SOH-76 20 oz. square Soho bowl. Like the rest of the Soho pattern, this 20 oz. 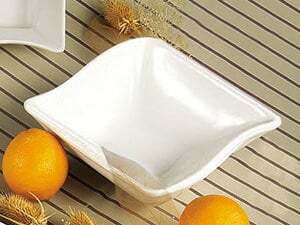 square bowl features gracefully flowing, contemporary lines and a beautiful american white color.